Paddle steamers and paddle boats have been on the Murray River and in the Murray-Darling Basin since 1853 when William Randell launched the first steamer the P.S. Mary Ann near Mannum, South Australia. 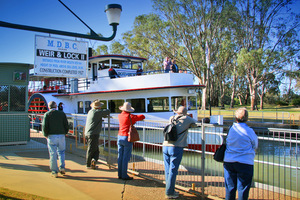 Today you can choose to see the Murray in various locations with some great boat cruises. Choose to ride the historic P.S. Marion built in 1897 at Mannum or enjoy the luxury of the Murray Princess. Visit the Port of Echuca where you'll find Australia's largest paddle steamer fleet with a variety of boats including Australia's oldest, the P.S. Adelaide or the EmmyLou In Mildura you can experience a great boat cruise on the P.S. Melbourne or the P.S. Industry in Renmark. Australia has the largest collection of active paddle steamers and boats in the world, so this is a great way to experience the Murray River and it's bygone era. You can also follow South Australia's River Boat Trail from the Border Cliffs to Goolwa. What does PS, PB, PV and MV mean? There is confusion at times around this. Generally boats that have been converted from steam power to diesel power will change their name from P.S. to P.B. However some boats have remained under the name P.S. for their heritage connection yet no longer run under steam power. All the Rivers Run (1983) Starring Sigrid Thornton as Philadelphia Gordon and John Waters as paddle boat skipper Brenton Edwards. Its about the highs and lows of the paddle steamer business in Australia in the early 1900s. Filmed mostly on location in Echuca on the Murray River and the PS Pevensy is converted to the PS Philadelphia. The River Kings (1991) Filmed on South Australia's glorious Murray River, this television mini-series is set during the 1920s and tells of the story of a runaway who escapes to the river to work on a paddle-boat steamer and his friendship with an old salt captain played by Bill Kerr. Know of another paddle boat or steamer along the Murray? Please contact us as we'd like to have it listed here on the Murray River website. During the latter half of the 19th and early 20th centuries the Murray River was a major inland highway for pastoralists, settlers and travellers. Fleets of paddle steamers and their barges carried produce from stations and farms to transit points downriver. There were floating shops bringing goods to the settlers, mail steamers crossing the lakes, mission boats and passenger liners, as well as small fishing boats, ferries, powerful milk launches and boats that helped build the weirs and kept the channels free of snags. Ports, trading companies and shipbuilding facilities were established, and many of the Murray’s settlements developed around the trade brought by the river boats. 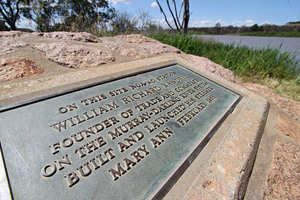 The Murray Darling river system paddle steamer’s began in South Australia on the 19th February, 1853 when William Randell and his brother Thomas George launched the PS Mary Ann just a few kilometres upriver of Mannum at Noa No landing. Sir Henry Young, the Governor of South Australia was convinced that the Murray River was Australia’s Mississippi, and that one day it could be a major trade route for the Colonies of New South Wales, Victoria and South Australia. To encourage the river transport, the SA Government offered a prize the first boats to navigate from Goolwa upstream to Victoria (Swan Hill). William Randell and Captain Francis Cadell in the PS Lady Augusta reached Swan Hill in Victoria on September 17, 1853 and opened up the inland river trading route. Both men went on to develop their commercial interest on the river. Cadell formed the River Murray Navigation Company and Randell eventually secured backing for The Murray River Company. No later than 20 years following, there were nearly 240 river boats plying the system with hundreds of thousands of tonnes of cargo such as wheat, wool and other produce being shipped. River towns such as Goolwa, Murray Bridge, Morgan, Wentworth, Mildura and Echuca become vital ports for distribution to the capital cities. Revenue raised from Border Tarrifs became a real challenge for river boat captains and the Colonies of South Australia, NSW and Victoria as businesses used the Murray to avoid paying their taxes. A succession of dry years from 1895, culminating in the record drought of 1902, brought general acceptance that some drought protection was required to allow further development of the Murray. Irrigation was seen as a primary source of growth and South Australia was also keen to protect its river boat trade. Now States, it was agreed in 1915 a series of locks and weirs would be built along the Murray and better utilise water storages on the Murray River. At a similar time modern rail and road networks took over the role of moving goods from region and river boat industry began a rapid declined. Many vessels fell into disrepair and abandoned. Today's river boats are a mixture of restored original vessels that have been painstakingly brought back to life along with modern boats that have the feel of classic paddle steamers. Some river boats also have had their steam engines replaced with diesel engines during restorations as the demand on trees over a period of time took its toll on the environment. The important and romantic era of paddle steamers may have passed by yet the experience and love affair remains. The Murray River today has the largest fleet of operational river paddle steamers and paddle boats in the world. It’s a great opportunity to experience what life would have been like over a hundred years ago along the Murray where you can experience the rumbling of genuine steam engines. For more information on Murray River paddle steamer experiences visit the boat listing at the top of this page and enjoy the a journey on these amazing and historic vessels.